Molde and its surroundings provide the perfect environment for mountain hikes! 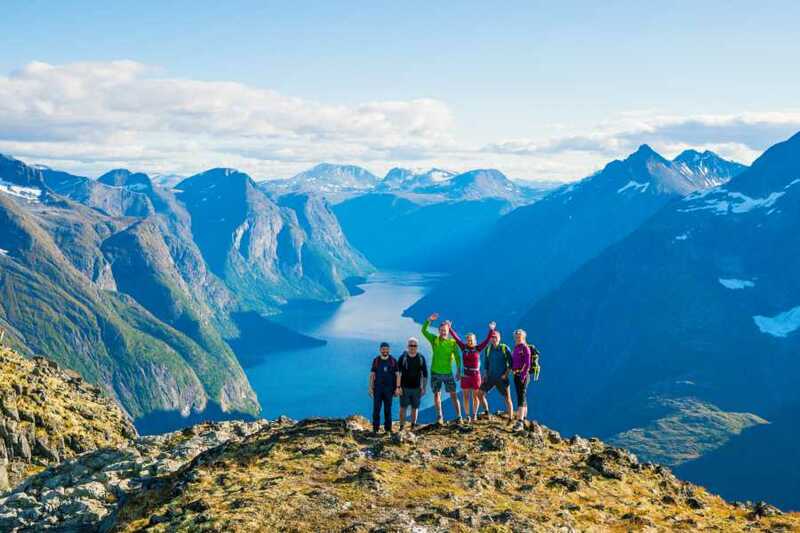 Pack your backpack, check out our offer and get out there to enjoy the amazing Norwegian nature and the breathtaking views you can experience from the top of the mountains. Read some of our recommended hiking trips on our website to get all the necessary details for your hike! Romsdalseggen: This is one of the most popular hikes in Møre og Romsdal. The hike leads through the spectecular mountains between Isfjorden and Åndalsnes! From several peaks above a 1000 meter, you can see magnificent views over Åndalsnes and Trolltindan. Read more here. Sjurvarden: A hike nearby the Atlantic Ocean Road. From the top of Melen and Sjurvarden you can see the open Atlantic Ocean, the Atlantic Ocean Road and the mountains to the south. Read more hear. Trollkyrkja: This hike leads up to a system of thrilling limestone caves with curvy tunnels and astonishing waterfalls. Read more here. Midsundtrappene: This hike over Midsund is an exciting hiking destination, on the island west of Molde. Read more here. Jendemsfjellet: A popular hiking destination among people living in Molde, providing spectacular view over the Atlantic Ocean. Read more here. Urfjellet: Another popular hike, close by Molde. This is the second highest peak of Fræna municipality. Read more here. You can book a guide only, who will meet you where the hike starts and lead you along the hike. The cost of a guide is NOK 4000. The maximum number of participants is 10. This option does not include transport. You can book a guide and transport. The total cost of such a trip is NOK 8000. Maximum number of participants: 8. Transport from Molde centrum to the mountain – where the hiking takes place – and transport back to Molde. Guide, who drives and leads the hike. If you are interested in a guided hiking trip, please contact us beforehand, so we can arrange the details for the hike!